Find hotel near Goulandris Museum Of Cycl ..
Cycladic Art means figurines and vessels made of Marble. 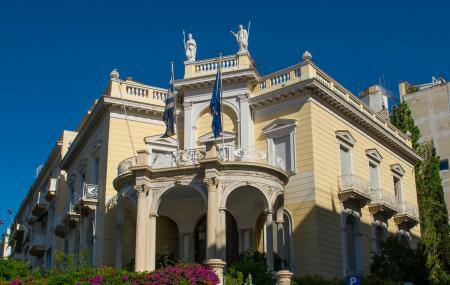 Founded in 1986 to house the collections of Nicholas and Dolly Goulandris, the Museum of Cycladic Art is dedicated to the study, preservation and promotion of ancient cultures of Aegean and Cyprus. After being granted permission by the Greek state, Nicholas and Dolly started collecting archaeological objects. The collection became renowned among scholars because of the rare and one of a kind Cycladic Art. Today, more than 3000 objects of Cycladic, ancient Greek and Cypriot art, dating from the 5th millennium BC to the 6th century AD, are on display at the museum. Busses: Α5, Ε6, Ε7, Χ14, 054, 200, 203, 204, 220, 221, 224, 235, 408, 608, 622, 732, 815. Love this? Explore the entire list of places to visit in Athens before you plan your trip. Fancy a good night's sleep after a tiring day? Check out where to stay in Athens and book an accommodation of your choice. How popular is Goulandris Museum Of Cycladic Art? People normally club together Omonoia Square and Six D.o.g.s while planning their visit to Goulandris Museum Of Cycladic Art. Great collection, well laid out. That rare thing: a museum where I actually felt like I was learning a lot, rather than just looking at a bunch of interesting objects. The first floor in particular should be a must-see. All housed in a beautiful building, with a great cafe. Interesting exhibits and the every day life exhibition in the last floor was remarkable. The staff is so friendly and full of joy. This visit really made my day. A true cultural center. If you like archeology and are fascinated by ancient civilizations, you must see this place. But even if you don’t know much, you will appreciate it. My favorite museum in Athens. Wonderful English descriptions and historical context. Great, thoughtfully arranged collection. A real joy to walk through.